Today’s recipe is a tad outrageous, in the oh-my-goodness that looks divine, kind of way. It’s a chocolate lovers fantasy with layers of chocolate cake studded with chocolate chips and pecans, stacked with swirls of dulce de leche infused frosting and topped with caramel drizzles. It’s finished off with chopped turtle candies and toasted pecans. If you’re not drooling by now, just wait until you see it! You’ll instantly add this recipe to your must-bake, and must-devour, list! Enjoy this Chocolate Turtle Cake! 1. Preheat oven to 350°. Grease 2 (9-inch) round cake pans with shortening; sprinkle with cocoa. 2. Beat cake mix and next 6 ingredients at low speed with an electric mixer for 1 minute. Beat at medium speed 2 minutes. Fold in chocolate morsels and chopped pecans. Pour batter into prepared pans. 3. Bake at 350° for 30 to 32 minutes or until a wooden pick inserted in center comes out clean. Cool in pans on wire racks 10 minutes. Remove from pans to wire racks, and cool completely (about 1 hour). Wrap cake layers in plastic wrap; refrigerate at least 1 hour. 4. Stir frosting and dulce de leche in a medium bowl with a whisk until well blended; set aside. Cut 6 turtle candies in half; set aside for garnish. Chop remaining candies. 5. Place 1 cake layer, top side up, on serving plate. Spread with half of frosting mixture; sprinkle with chopped candies. Place second cake layer, top side up, on candies. Spread remaining frosting mixture on top of cake. Cover; refrigerate until serving time. 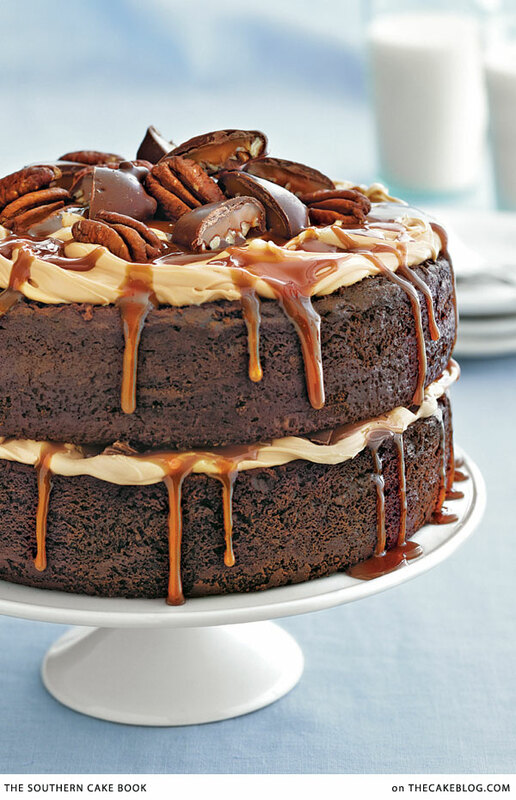 Drizzle caramel topping over top of cake, allowing some to drip down side. Top cake with pecan halves and reserved turtle candies. Serving Secret: With exposed chocolate layers, piles of frosting, and pieces of turtle candies and pecans to adorn the top, this cake is a showstopper. Hold back on the caramel drizzle for the prettiest look, and serve extra on the side. 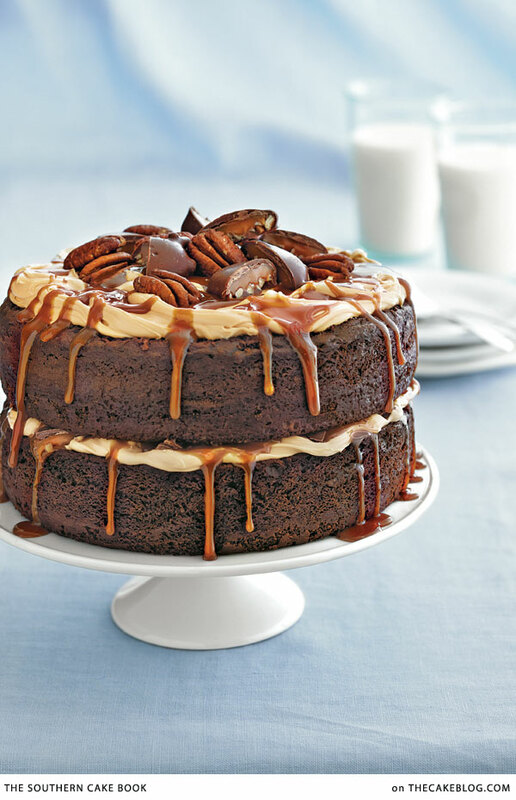 Excerpted from The Southern Cake Book by Southern Living. © 2014 Oxmoor House – an imprint of Time Home Entertainment Inc. Used by permission of the publisher. All rights reserved. « What to Do With Cake Scraps? I just came across your blog and saw this de-licious-looking cake, and I just couldn’t stop browsing your blog. I’m already a huge fan of yours and I’ll propably try all of your cakes as soon as possible. Thank you so much for these AMAZING recipes, I really adore you..! I’d love to make this, but me don’t have box mixes in Germany. Can you suggest a scratch cake please? I made this yesterday for my Grammy’s birthday. It was soo good. I used salted caramel topping to accent the sweetness. Everyone loved it, even the ones who don’t eat much sweets. The only downside was having to buy two boxes of cake mix because the biggest Walmart carried is 16.5oz. I just made this cake for my husband’s birthday and WOW! This was amazing! I have never been very successful with cakes as ~fancy~ as this one, but I can’t believe how easy this was! What a presence this cake has. Thanks so much for sharing this recipe. This may be my go-to cake for parties now! Where do you buy canned dulce de leche? Is there a similar substitute? In the baking isle of the supermarket it is usually near the condensed milk or if they have a Spanish foods section it may also be there. Made this delicious cake for my husband’s birthday. Everyone loved it. One thing I do have to say, the baking time was now long enough. I had to add an extra 15 minutes. I hope I didn’t just over look it, but where does the unsweetened cocoa come into play? It’s the second item on the ingredients list, but I didn’t see where it should go in the recipe. Oops! Just saw it under the first paragraph of instructions. Wow! This looks so yummy!!! I am going to attempt to make this cake, but from scrach, complete with from scrach cake, frosting, and even the carmel and turtles! Turtles are my husband’s favorite candy, so I’m doing all this for my husband’s birthday. Wish me luck! Can you prepare this cake in advance? I am hosting a party on Saturday and I am wondering which parts can be done in advance (on Friday)….any help would be much appreciated! Sure, you could make this cake in advance. Cover it loosely with plastic wrap and store it in the refrigerator. To keep it extra moist and looking fresh as well, bake the cake layers in advance, wrap them individually in plastic wrap and store in the refrigerator. On the day of the event, mix the frosting and assemble the cake. I made the cake and it was delicious. My family loved it. If I wanted to make cupcakes, do you know how many cupcakes this recipe makes? That’s great to hear! This should make around 24-30 regular sized cupcakes. 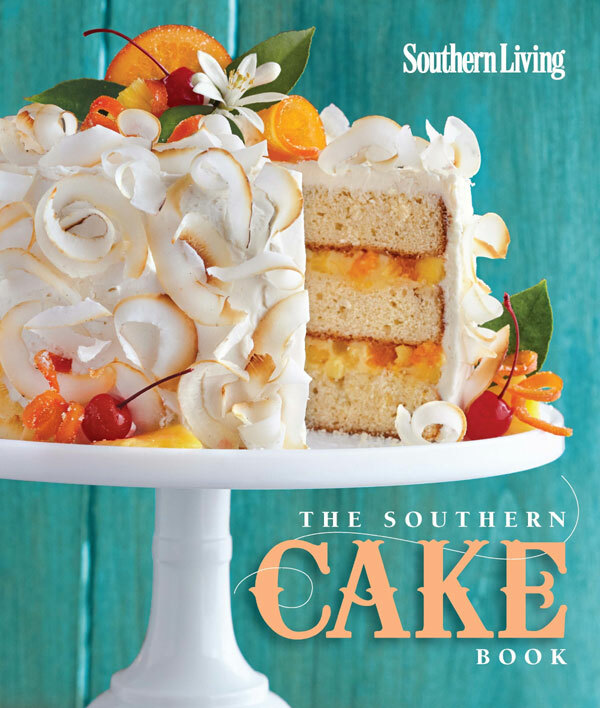 What cake is that on cover of Southern cake cook book? That looks yummy too! I’m making this cake for my husbands birthday tomorrow looks so scrumptious and looks like everyone has had great success with making it! On the cover is their Ambrosia Cake – a combination of orange, pineapple and coconut! We are not a cake family but I made this for my husband’s birthday several years ago and IT WAS A HIT! We now call it his birthday cake and I only make once a year to celebrate his birthday, which happens to be today. It’s currently baking and smelling more glorious then I remembered.